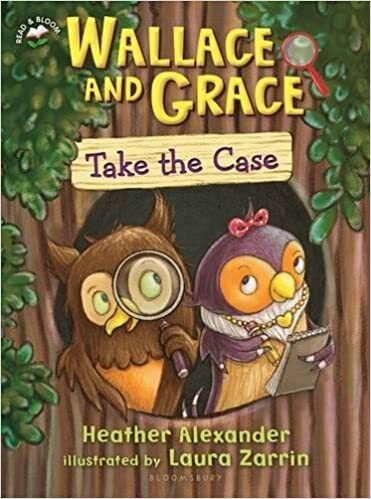 Summary: Wallace and Grace are two owl friends and partners in the Night Owl Detective Agency. Wallace is a careful rule-follower, and Grace is an enthusiastic go-getter, but each one appreciates the qualities of the other. In this first installment, the two friends are hired by Edgar the rabbit to investigate a ghost-sighting in the kale patch. Carefully gathering and clues and using a bit of logical reasoning, they are able to work together to uncover what’s going on. Readers can look forward to a couple of sequels, as well as some similar series in Bloomsbury’s Read & Bloom imprint for newly independent readers. 80 pages; grades K-2. Pros: A perfect first chapter book, with plenty of colorful illustrations and gentle humor. Cons: Wallace comes across as a bit of a stick-in-the-mud.